MicroBAM (Brewster Angle Microscope) enables visualization of monolayers, typically at the air-water interface in a Langmuir Trough. By detecting changes in the refractive index of the water surface in the presence of surfactant molecules, MicroBAM provides information on homogeneity, phase behavior and film morphology without the need for any external agents such as fluorescent dyes which could interfere with the Langmuir layer. Good resolution (12 µm) and large field of view for film homogeneity and domain size studies. Capture and save still images of monolayers. Can be set to take pictures automatically as a function of time or surface pressure. Compatible with most Langmuir troughs and Langmuir-Blodgett troughs. Optimal for routine LB film homogeneity check prior to deposition. The KSV NIMA MicroBAM is an easy-to-use instrument for non-invasive imaging of mono-molecular layers at the air-water interface. The good image quality and lateral resolution make it an ideal instrument for the visualization of morphological film parameters (e.g. compressed film homogeneity, domain size, shape and packing). Real-time observation and recording of film structure enables dynamic activity to be captured. 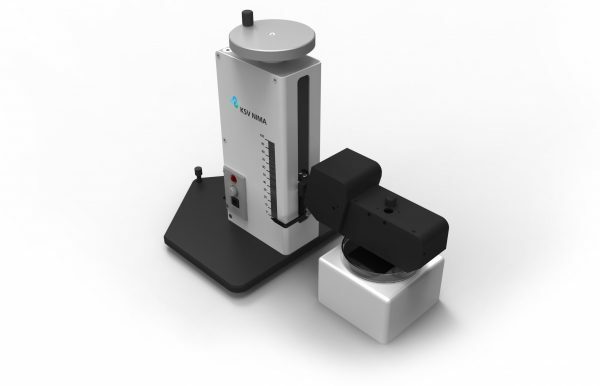 The KSV NIMA MicroBAM can be used with most KSV NIMA Langmuir and Langmuir-Blodgett Troughs, to provide real-time image measurements as a function of time or surface pressure. The KSV NIMA MicroBAM connects directly to the computer via USB making it remarkably easy to setup and use.